The total municipal universe has over one million individual securities. Most muni indexes hold tens of thousands of bonds—the benchmark for our National Muni strategy, for example, is the Bloomberg Barclays Municipal 1-10 Year Blend Index, and it holds a constantly changing roster of more than 30,000 securities. The question all managers face: How can one track and/or outperform such a vast index, when owning the full index is essentially impossible? Many managers feel obligated to adhere to benchmark parameters—they may adjust duration or seek out attractive bonds as part of their process, but they still largely stick to their benchmark’s duration, credit and sector boundaries. We are very different. We invest from the bottom up and build portfolios one bond at a time—an approach that often leads to credit and sector weightings that are quite different from our benchmark. We are not intentionally making bets in relation to our benchmark; rather, we build portfolios based on where we see risk and relative value in the market. Where others may consider benchmark divergence as a risk, we see it as an incidental outcome of our search for greater value. A problem with any top-down, index-driven approach, in our view, is that it chains the portfolio to an index of securities that is not in any way discerning about its constituents. There is nothing magical about the securities in these indexes. Our benchmark includes literally every fixed-rate bond issuance in the U.S. that meets certain criteria (such as deal size and maturity range), regardless of merit. In contrast, we start from zero, and build our portfolios from the ground up. Our portfolios differ from our benchmark, because our goal differs from the benchmark’s goal. The benchmark seeks to represent every eligible investment in the universe—the benchmark does not care if those securities expose investors to risks they consider important. We seek to offer performance within a risk tolerance defined by the client, so we invest where we see relative value—NOT where a benchmark tells us to invest. (Our recent publication, “It’s All Relative,” offers a deeper dive into our team’s philosophy and process for building portfolios and selecting securities). The chart below highlights several of the more notable overweights and underweights in our National Muni portfolio as of June 30, 2018. Our strategy focuses entirely on finding securities that offer relative value compared to the rest of the available universe. 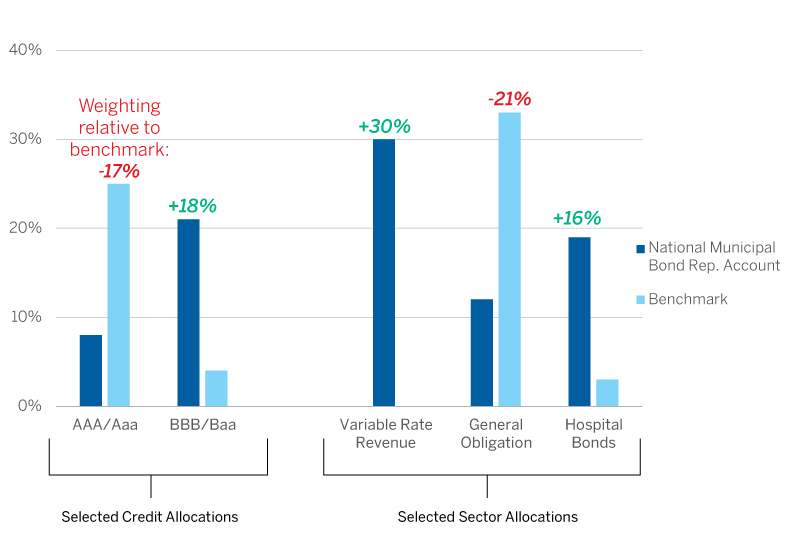 This approach often leads to portfolios with very different credit, sector and duration weightings than the benchmark—to be clear, these are NOT top-down bets, but rather results of a bottom-up process. Source: Bloomberg as of 6/30/18. The portfolio information is based on a representative National Municipal Bond account and is provided as supplemental information. Portfolio level information includes cash and cash equivalents. Our underweight in AAA bonds and overweight in BBB bonds has been a fairly consistent trend for the portfolio. We traditionally find a healthy number of bonds in the BBB and A range that, in our view, offer a favorable mix of potential return and risk. Our credit research process gives us confidence to own these bonds; in a number of these cases, we find that the issuer’s credit profile has improved markedly over a period of years, but the agencies have been slow to upgrade their ratings. On the other hand, demand for AAA-rated munis historically has been supported by a large segment of investors seeking safety that simply want to minimize credit risk as much as possible. As such, we find that the value offered by these AAA securities is less than compelling during many points in the credit cycle. We also hold a fairly large weighting in variable-rate bonds; our benchmark, due to its eligibility requirements, holds no variable-rate securities. We feel that short-duration fixed-rate municipals are currently overvalued—with widespread anxiety about rising interest rates among bond investors, many are gravitating to the short end of the yield curve. The variable-rate short-term securities that we own currently offer yields that are compelling compared to fixed-rate bonds, while having far less interest rate exposure. Both of these examples highlight the opportunities available within a bottom-up, fundamental approach to investing. We feel our clients are far better served by an independent mindset and a process that focuses on relative value, not by one that is strictly beholden to a benchmark. Bloomberg Barclays 1-10 Year Municipal Blend (1-12) Index is a market value-weighted index which covers the short and intermediate components of the Bloomberg Barclays U.S. Municipal Index. It tracks tax-exempt municipal General Obligation, Revenue, Insured, and Prerefunded bonds with a minimum $5 million par amount outstanding, issued as part of a transaction of at least $50 million, and with a remaining maturity from 1 up to (but not including) 12 years. Both indexes include reinvestment of income. One can not invest directly in an index. Bloomberg Barclays Indices are trademarks of Bloomberg or its licensors, including Barclays Bank PLC.